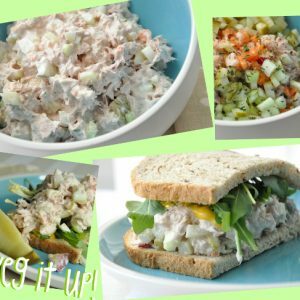 We love this Veggie Loaded Tuna Salad Recipe for sandwiches and salads. This easy peasy recipe is pescatarian, gluten-free, and loaded with vegetables for flavor and texture. Gah! I can’t get enough of this healthy tuna salad! While stuffing my face yesterday I realized something — I have an entire arsenal of recipes that have never been posted. I guess I figured simple dishes like sandwiches, wraps, salads, and such were boring and didn’t merit their own post. But what they could use, is a little attention! I’ve decided to whip up a few posts on how I take a simple ho-hum dish and amp up the nutrition density. I gave up counting calories when they started to take over my life a few years ago… so instead I count veggies! Regardless, it’s a positive and healthy way to approach a meal, right? Win-win! Every week or so I’ll toss up a VEG IT UP! style post and count veggies instead of calories. Taking your typical diet and vegging it up takes a little practice, but once the habit is formed, your body will thank you in a bazillion different ways! Shiny hair, strong nails, glowing skin, a happy heart, and even a little sparkle in your eyes or a skip in your step. So join me, and challenge yourself to add extra veg to your favorite dishes! 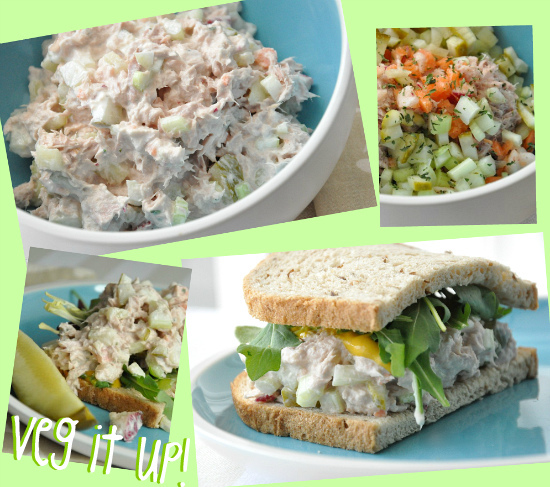 We love this Veggie Loaded Tuna Salad Recipe for sandwiches and salads. This easy peasy recipe is pescatarian, gluten-free, and loaded with vegetables for flavor and texture. Gah! I can't get enough of this healthy tuna salad! add a little... or a lot! To make into a super flavorful sandwich that rivals your local deli, combine all ingredients, spread onto fluffy rye bread with a little mustard, top with arugula or romaine lettuce and dig in! Tuna and rye are a match made in heaven so hunt down some whole grain rye instead of the typical white bread. If you have 'em, onion and tomato are also di-vine piled on top of this sandwich. Use what you have and, as always, have fun with it! A colorful lunch is a satisfying lunch. 1. Shut your beautiful mouth and 2. I have a solution! Veg up a week’s worth of eats by prepping raw veggies just once over the weekend. You can do this with a trusty chef’s knife and cutting board or break out your food processor. The last batch I whipped up in my cheap-o food processor included finely diced/shredded celery, carrots, and radish. A handful went into a mini-batch of veggie cream cheese and I simply chopped up 1/4 a giant dill pickle and added it to another handful of shredded veggies for a practically effortless tuna salad. Now I have just enough leftover to toss on top of a big fat salad. See? Ridiculously easy meals for just a few minutes of work! Get your gluten-free on or simply save calories by piling this veggie filled tuna salad atop a bed of greens. If you’re feelling feisty or just working with minimal ingredients scoop it up with a chunk of lettuce or even tortilla chips! You can even go full on mexican with a vegged up Fiesta Tuna Salad w/ avocado. It’s kind of a big deal around here. It has many leather-bound books and an apartment that smells of rich mahogany… It’s the Ron Burgundy of tuna salad spin-offs. So add some extra OOMPH to your tuna salad with veggies. Don’t rely on gobs of fat for flavor — let the veggies do all the work! And while you’re at it… try this healthy tuna salad stuffed into cucumber cups! Do you veg up your tuna salad? If not, you totally will now… right? If you get a chance to try this veggie loaded tuna salad, let me know! You can leave me a comment here (LOVE checking those daily!) or tag @PEASandCRAYONS on Instagram so I can happy dance over your creations. I can’t wait to see what you whip up! Ive recently discovered picked red onions. I chop them up, add bread & butter pickles, cherry tomatoes and shredded lettuce. I add mayo, dill weed, s&p. Great as a sandwich or on greens. Ive also added banana pepperd. I know this is an old post, but this was AWESOME. I put my tuna salad into a red bell pepper. Double awesome. I love greek yogurt! Ooh!!! So tempting! I love tuna salad. That pickle relish in there just tells me it’s extra delicious. Yummy,yummy, yummy! I love to “veg” up my tuna! I will have to try using Greek Yogurt… sounds delish. Love that you used Greek yogurt. Sounds delicious! It’s delish! You can even add some leftover guac or mashed avocado to the mix for extra creaminess =) soooo good! This looks amazing! 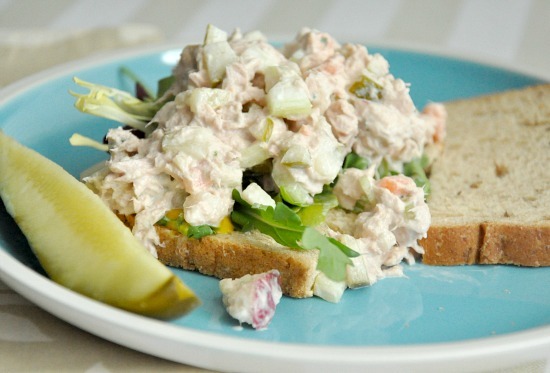 I love tuna salad, but I always feel guilty about the mayo…greek yogurt is a great solution! I love adding veggies to tuna salad…and whatever else I can. It’s such a simple way to make your meal healthier and more filling. Love the concept of counting veggies, I think it’s much more manageable to think of the additive things rather than what needs to be yanked from our diets. Have you tried tunas in a jar? So flavorful. I add red onion, celery, jicama and a little red cabbage to tuna. I also have it over greens. Never enough veg. Don’t think these are boring recipes I think these are the ones we all use time and time again. Yummy salad! I love love tuna salads especially the way you made it!!! I love tuna sandwich!! Love it. Love tuna with pickle cucumber and cream cheese but the problem from eating tuna is THE SMELL after…hehehe. #1 had me in absolute stitches. I love stopping by for good food and good fun! I always veg up my tuna sandwiches! I just LOVE it! Your recipe looks tasty, love all the veggies. If you really want to get creative you can make this totally vegetarian using a combination of sunflower seeds and almonds.. Have a wonderful weekend. Thanks for the recipe!! 😀 I’m gonna try it today! What a great Lent recipe. I bookmarked it for later. Thanks for sharing with us. I love tuna fish. I like mine with onion, celery and red peppers. Yum! My weeks are so much better when I prep all my veggies in advanced. I only do it about 50% of the time though. I love all your add ins to the standard tuna salad! My mom used to make this EVERY Sunday after church. She added apples to the mix… which sounds weird but we loved it! Oohh! Love the Idea! I usually just do tuna! New views and ideas are coming into my brain this minute and I can’t wait to try them! yayyyy! Hope you love it Laura Jayne!! I think I’m making it again for dinner… editing the photos made me crave it like woah 😉 Happy Friday! You seriously just made me so hungry!!! Thanks for stopping by today! I LOVE this idea – especially the gluten-free suggestion! I’m totally buying tuna at the store tonight! I always add in extra veggies to my tuna sammys for the crunch! Shredded carrot sounds good, will try that next! Yes I definitely veg mine up! Love tuna tacos!!!! =) Totally try the radish sometime – it’s a great addition! I don’t really like any fish actually. perhaps that is more the problem. I did however save this page to pinterest so that I can try it out one of these days on my husband. Will probably wait till its warm enough to open a window though so I can try and deal with the tuna smell 😡 lol. Great ideas. I always veg up my tuna salad. It’s so much better with all the crunchy bits! I love that you siad Oomoh when describing a tuna fish sandwich! I love tuna fish!!! I seriously never thought about putting radishes in there (just ate tuna lettuce “tacos”) but you can bet I will next week! YUM!